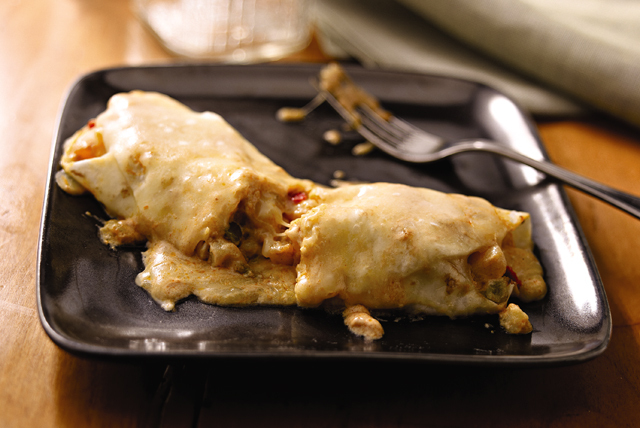 Go meatless with this cheese enchilada recipe. This Meat-Free Cheese Enchilada Recipe is hearty, tasty and easy to make, too, thanks to frozen potatoes. Cook potatoes as directed on package. Meanwhile, mix enchilada sauce and sour cream until blended. Heat oven to 350ºF. Combine potatoes and 1 cup enchilada sauce mixture. Spread 1 cup of the remaining enchilada sauce mixture onto bottom of 13x9-inch baking dish sprayed with cooking spray. Spoon about 1/2 cup potato mixture down center of each tortilla; roll up. Place, seam-sides down, over sauce in baking dish; top with remaining enchilada sauce mixture. Sprinkle with cheese. Bake 10 min. or until enchiladas are heated through and cheese is melted. You'll know it's a special occasion when you get to enjoy a serving of these delicious enchiladas.